Theresa Cartier is content developer for Toolingu.com, Cleveland, OH. Toolingu provides online training for manufacturers, including a curriculum on rigging: 866/706-8665; www.toolingu.com. small slings to powerful cranes. 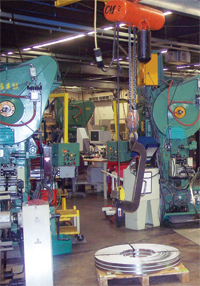 In the metalforming industry, specialized lifting devices such as C-hooks find use as well. However, the principles for moving a load safely and effectively are the same regardless of the rigging application. • Inspect all rigging equipment thoroughly before starting a job. Manufacturers often provide guidelines for measuring levels of deterioration and deformation in a part. Any worn or broken equipment must be repaired or replaced before use. • Know the working-load limit (WLL)—the maximum load that a device or equipment can carry. Often, the WLL appears directly on the equipment. If not, consult the equipment manufacturer. • If unsure if a particular piece of equipment can handle a given load, consult an experienced rigger, or simply reduce the load to a level well below the WLL. • Wear personal protective equipment (PPE) at all times. At minimum, riggers should wear hard hats, work gloves and steel-toed boots. • Hoists and cranes must receive operational testing and rated load testing before being used for the first time. In the rated load test, test loads should exceed 125 percent of the rated load unless recommended by the manufacturer. Also, only trained employees should be allowed to operate hoists and cranes. • Avoid shock loads. Rapid changes in movement such as jerking or swinging a static load, or sudden release of a load, creates a rebounding action that can damage rigging equipment or cause it to fail. • Never stand beneath a load or in the path of a moving load or an AGV. • Store rigging equipment in a dry, protected environment. • Keep records of equipment maintenance where all employees can access it. This information helps riggers decide if equipment is ready for a particular job. Although basic safety rules are important, proper rigging also benefits from having employees understand the forces involved in moving loads. Motion, gravity and the strength of materials all affect how safely and smoothly a load can be moved. Over time, stress on wire rope wears a individual wires and elongates the strands. Measure wire rope from the top of one strand to the top of the strand directly opposite it, rather than across two strands side by side. know the total load of the object being moved. The weight of a coil, for example, typically is provided by the supplier, but if not, there are tables available that provide the weight per cubic foot for standard materials. Shop personnel also must locate the load’s center of gravity. For regularly shaped objects, the center of gravity typically is located at the center of the object. However, for irregularly shaped objects like large stamping dies, you may have to make several adjustments before the load is balanced. Any load that tilts more than 5 percent after being lifted off the ground is unbalanced and must be readjusted. Wire rope finds use for jobs that require extra strength and abrasion resistance. Be sure to measure the rope periodically to ensure its diameter falls within acceptable parameters. Over time, stress on the rope wears a individual wires and elongates the strands. Once the rope falls below the minimum diameter recommended by the manufacturer, it is no longer safe for use. Measure wire rope from the top of one strand to the top of the strand directly opposite it, rather than across two strands side by side. Rope manufacturers also recommend measuring the rope at three places, at least 5 ft. apart, and using the average of the three measurements. Rope also can become damaged from repeated dragging over surfaces. A common cause of rope damage is repeated passing of the rope over a drum or through a block. Generally, abrasion resistance depends on the type and hardness of the metal alloy used to construct the rope and the size of the individual outer wires—ropes with larger wires better resist wear than do ropes having smaller wires. Chains are highly resistant to abrasion and corrosion and find use for applications that would otherwise tend to damage fiber or wire rope. Chains must be inspected link-by-link prior to any rigging job. Wear typically occurs at the bearing point. 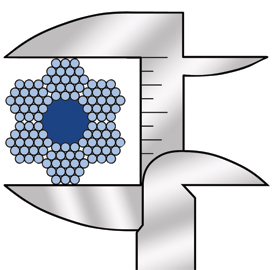 If you find a worn link, measure the cross section of the link with a caliper and check its measurement against an unworn area of the link. Still, chains must be inspected link-by-link prior to any rigging job. Begin by cleaning the chain with a non-acid, non-caustic solvent so that marks, nicks and other defects become visible. Then lay out the chain on a flat, well-lit surface and examine links for stretching, bending, cracks, wear and rust. Links often become bent or gouged when a chain has been wrapped around an object with sharp edges. Discard any chain that is bent at the weld point. In a chain link, wear typically occurs at the bearing point. If you find a worn link, measure the cross section of the link with a caliper and check its measurement against an unworn area of the link. If the worn link is less than the minimum allowable thickness, remove the chain from service. 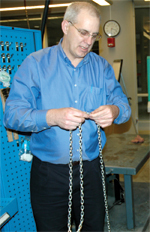 When inspecting chain slings, use the same criteria used to inspect a single chain. In addition, check the sling for proper identification information. The sling should have a tag or other identifier that gives the sling’s size, reach, working-load limit, sling type, and a serial number with the manufacturer’s name or symbol. Do not use slings missing any of this identification information. Metalformers must keep an eye on sling angle when using slings to lift loads. Vertical and horizontal forces come into play when lifting objects with a sling, and the amount of force exerted on the sling increases as sling angle decreases. A good rule of thumb: avoid sling angles less than 45 deg. Otherwise, consult with the sling manufacturer on recommended sling angles, inspection criteria and proper use. The capacity of the sling changes depending on the configuration—choker vs. basket, the number of legs on the sling and the angle of the legs. Basket hitches have higher working-load limits than do choker hitches.